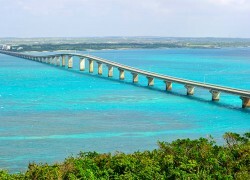 Kurima Ohashi is a bridge that connects Miyako and Kurima islands. The scene can be vastly different depending on the tide. Many locals and visitors cross the bridge to enjoy the stunning views it offers.